Grace and Peace Quilting: It's Been a Busy Week In Quiltland! 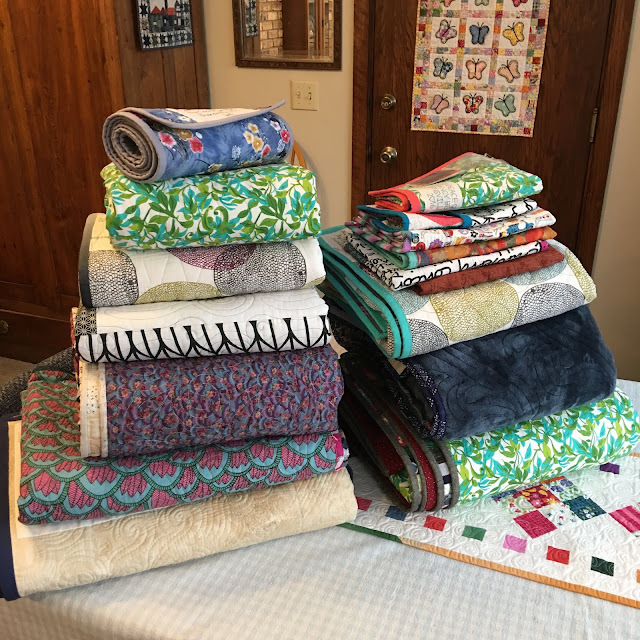 It's Been a Busy Week In Quiltland! 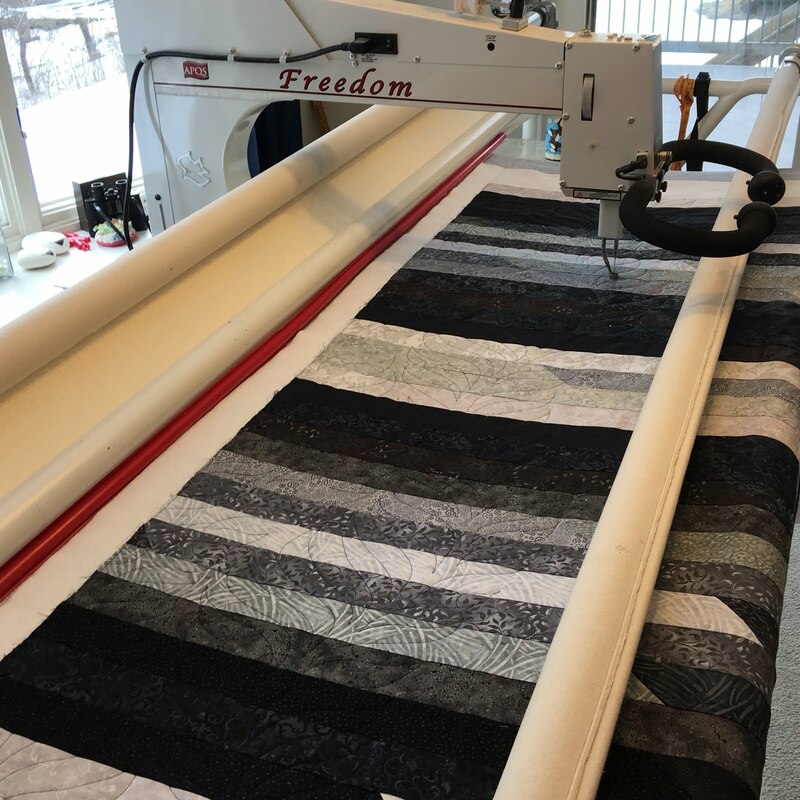 It's been a busy week in Quiltland, quilting for others, and getting ready for our guild's annual quilt show. 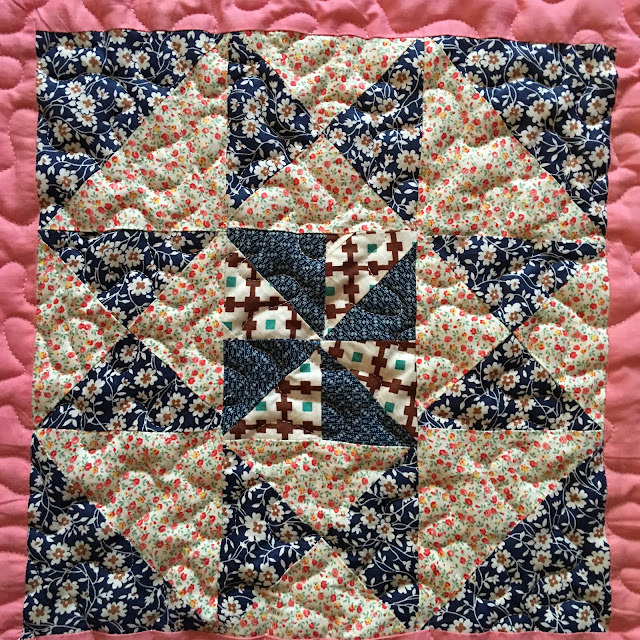 First off, I quilted and bound this antique beauty for Kay this week. 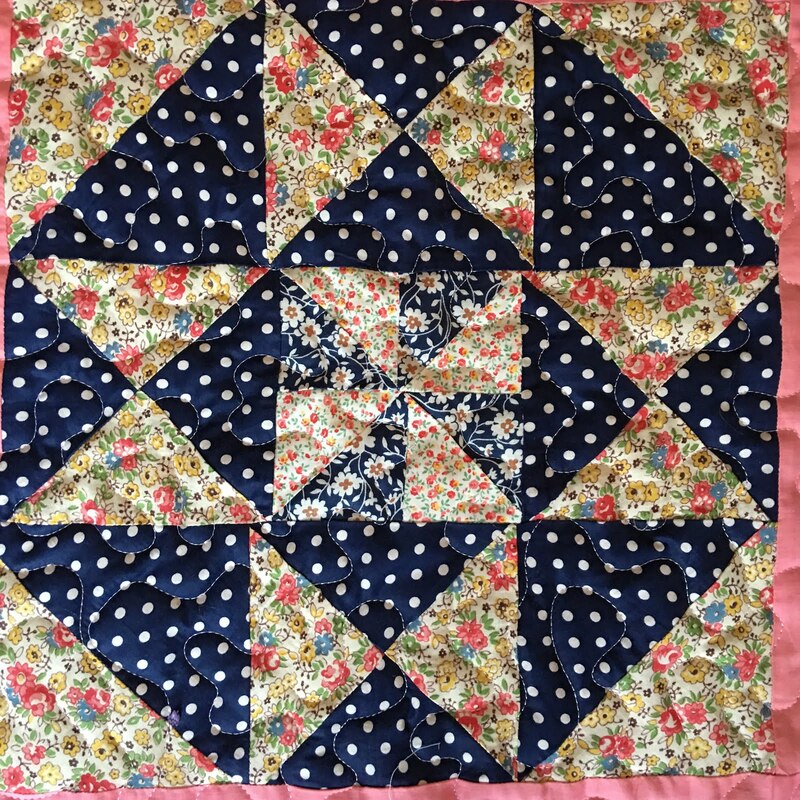 It was made around 1940 by her grandmother. The indigo and bubblegum pink combo is so cute!!! 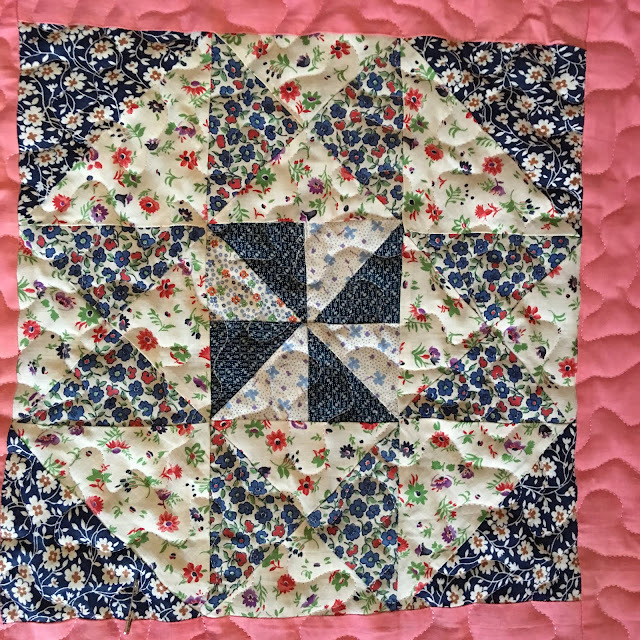 I used wool batting and meander quilted it, as there was 5" variation in the width of the quilt. The wool batting filled it in nicely and it came out flat and square in the end. It will be a family heirloom that will be cherished by many generations. Next up is this wilderness animal quilt I quilted for Jane. 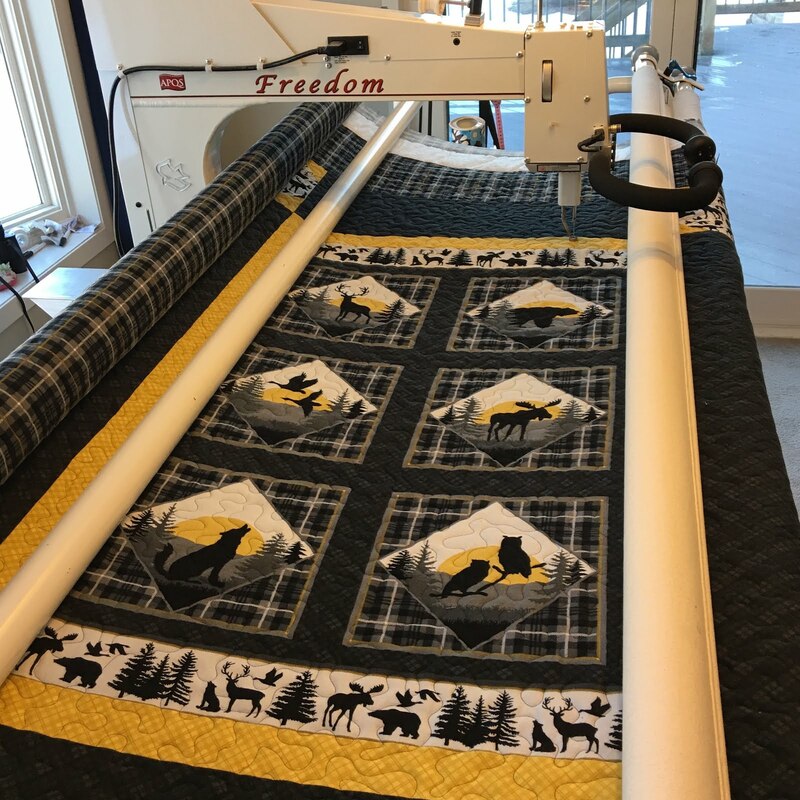 She made it for her 23 year old grandson, who wanted a quilt of his own for the cabin. 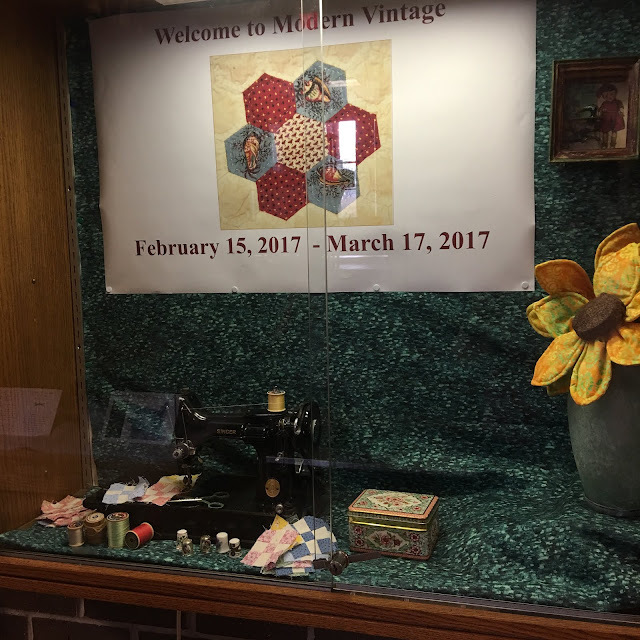 The Dakota County Star Quilters quilt show runs from February 15 through March 17, 2017. We have invited the Minneapolis Modern Quilt Guild to join us this year, therefore the theme of the show is "Modern Vintage". And lastly, I'm including a photo of my finished En Provence Bonnie Hunter mystery quilt hanging at the show. 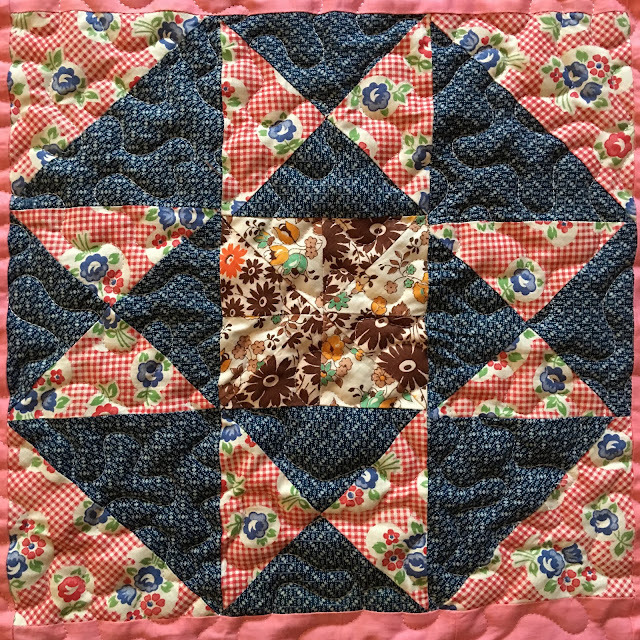 The final link-up for this mystery quilt is going on at Bonnie's website Mystery Monday Link-up Finale. Go there to see a number of fantastic takes on this quilt. 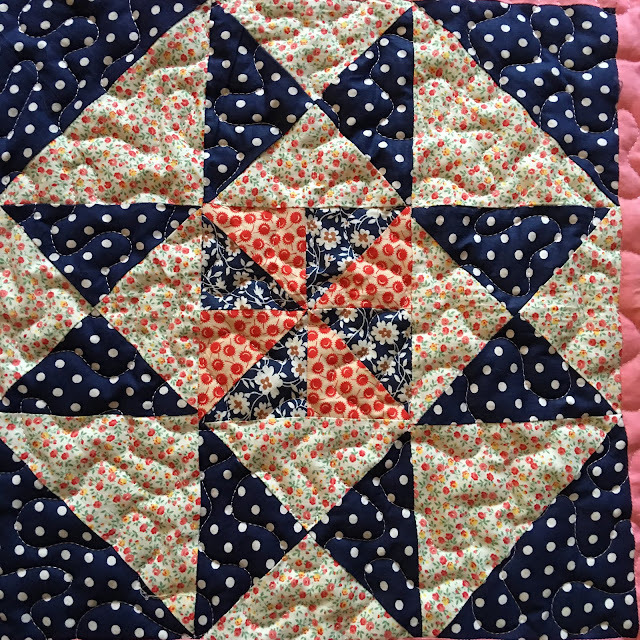 And thank you to Bonnie for such a fun quilt get-together/sew-a-long!!! I so enjoyed your quilt show of finished quilts (especially your En Provence Quilt--a stunner! ), as well as the overview of your Guild's Quilt Show from atop the action. An inspiring post! 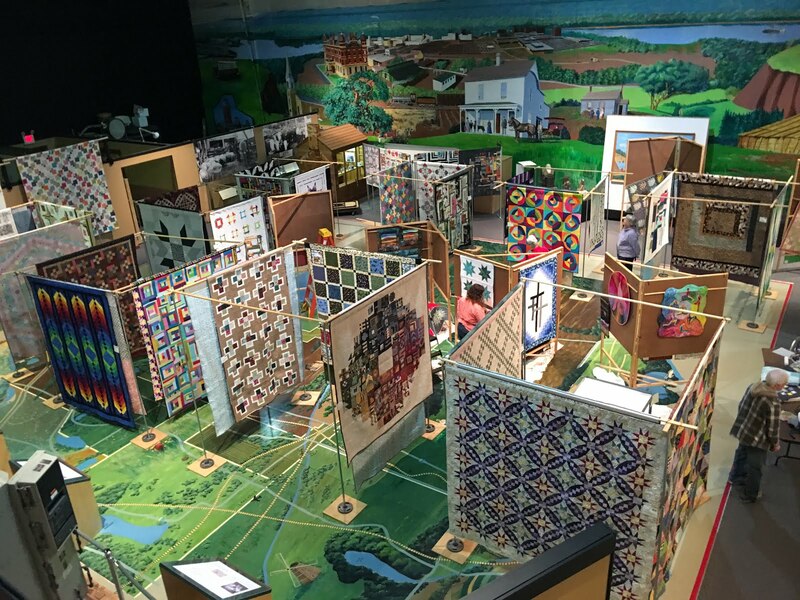 What an amazing venue for a quilt show, have a wonderful time! I love your en provence finish, mine is still in progress since I decided to redo some of the colours. Thanks for linking to TGIFF. Thanks, Carie! Yes, so glad it can move on to being loved and used. 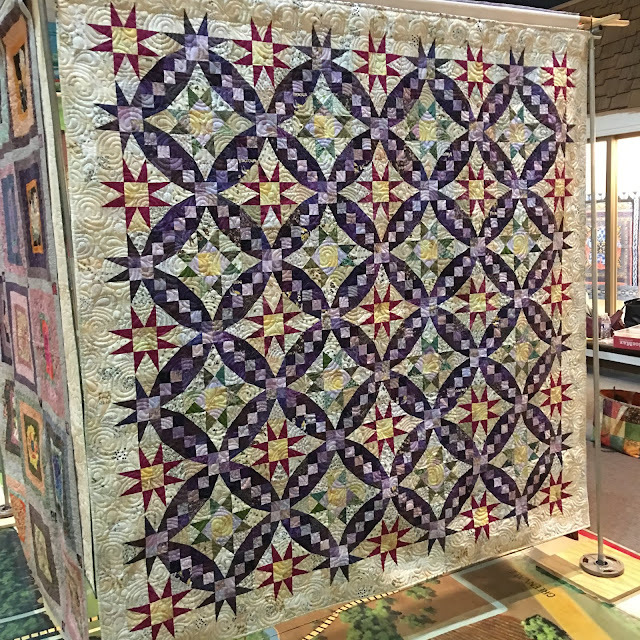 What gorgeous quilts...at the show and on you long arm! Your BH Mystery turned out beautifully!! 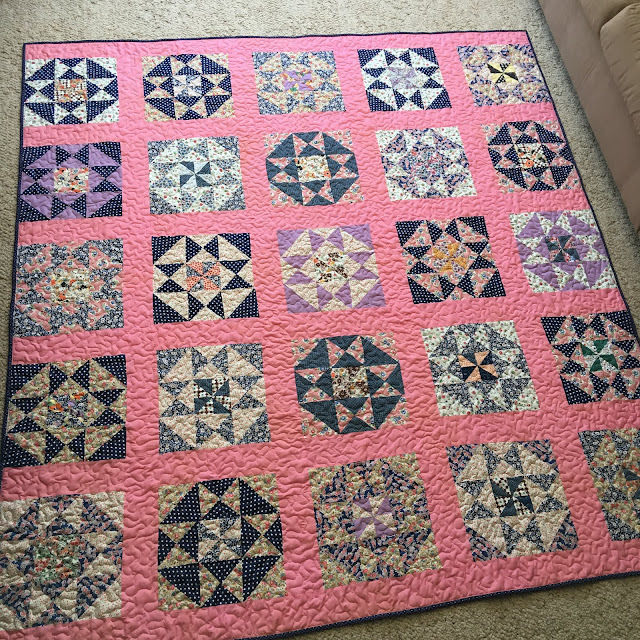 quilt shows are a lot of work, but well worth the effort. yours like it will be great, also love all the quilts you showed especially the outdoor one. sometimes it is hard to find one that will appeal to the man in your life. All of the things you have been working on are lovely! I especially like your version of En Provence. Ohyou had me at Bubble GUm Pink!!! 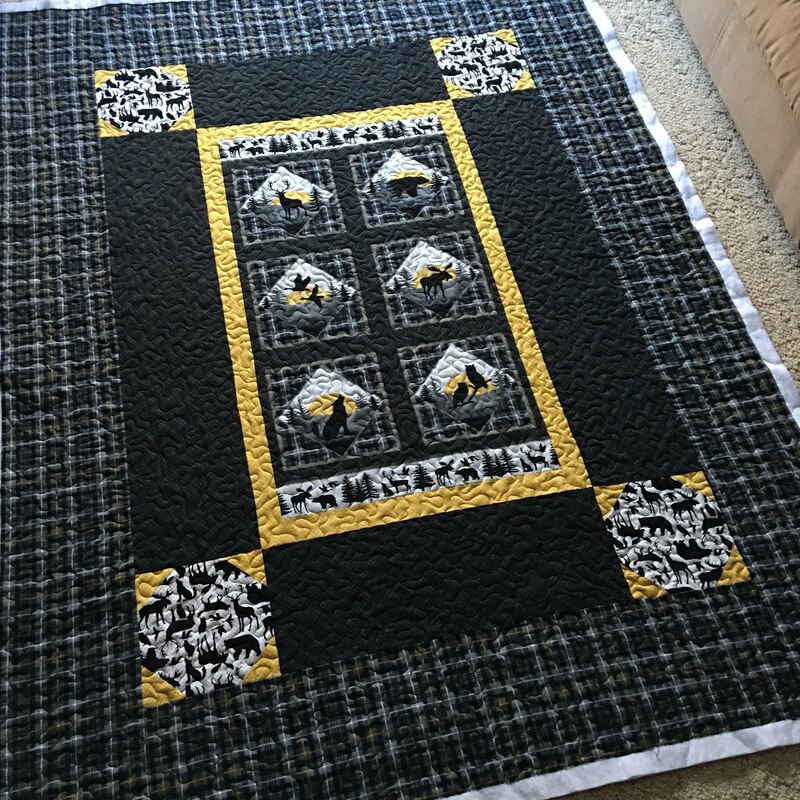 I LOVE that quilt - what a treasure that will be for that family!!! Your mystery quilt is lovely, and the show looks wonderful! You must be so proud o have it in the show! Your En Provence is beautiful -- it has a very balanced, restful feel to it. Partly your design change, partly your fabrics, I think. Great job! Your En Provence quilt is lovely. The vintage quilt is gorgeous, what a great family heirloom. Congrats on finishing your En Provence, it's lovely. 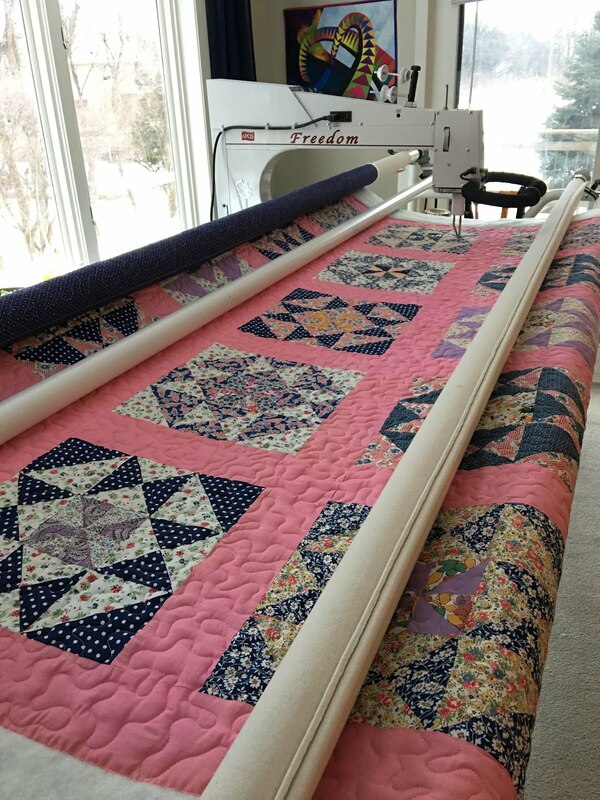 I love the pink sashing on the antique quilt.And your quilting on En Provence looks great.